My Hollywood Red Carpet Experiences! Previous article: England to San Diego and Upcoming Event Excitement! Event Preparation Experiment Week 6: My Hollywood Red Carpet Experiences! Against the Grain hit 5 best-seller lists, making me a best-selling author! 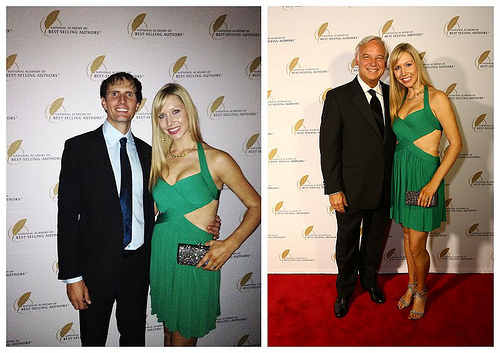 This week, I’m thrilled and honored to be attending a couple of red-carpet events, one of which is an awards gala. Read on below to see how my week went. I started the day off with a workout. I did a 1-hour workout of my creation plus 10 minutes full-body stretch on the Power Plate. I did some work on my business and some writing. Then Chea and I went to her baby shower, which was at a Thai restaurant in Mira Mesa. It was a lovely afternoon! In the evening, Tom and I spent some time together. Day 36 complete. I’m excited about the birth of my new niece soon … I’ll be an aunt to two nieces! I woke up at 5:00am and did a 20-minute HIIT workout of my creation. After I finished coaching in the morning, I worked on my business and did some writing and product creation. I coached again in the afternoon and then started to get ready for my trip. Day 37 complete. It was a productive day! Today was Tom’s and my day off together. I did a 30-minute Turbo Fire Turbo 30 Class plus 10 minutes full-body stretch on the Power Plate. Tom and I spent a lovely day together. Day 38 complete. I love that Tom and I have a day off together each week! I did a 20-minute HIIT workout and then finished getting ready to leave for Hollywood. It was exciting to arrive at the Hollywood Roosevelt Hotel, where we got to relax a little bit before getting ready for the evening cocktail red-carpet event. The event was by the famous pool area, which is beautiful. It was amazing to meet lots of best-selling authors, including Jack Canfield of the Chicken Soup for the Soul series! Tom attended this event with me. Tom had a great time attending this awesome event. He liked the food, unique musician, and everything else. He said it was a very well-done event. Day 39 complete! It was an incredible first red-carpet experience! The day began with a breakfast with fellow best-selling authors and a summit throughout the day. It was a learning experience put together especially for best-selling authors, and it was very inspiring! I spoke with so many successful entrepreneurs. Being surrounded by over 300 best-selling authors is an amazing experience in itself! Tom and I then went around Hollywood, enjoying the area and sights. We found a lovely sushi restaurant where I of course found a delicious vegetable rice dish. Day 40 complete. It was an awesome first day of the summit for best-selling authors! This day was full of so much excitement and many incredible memories! After breakfast began day two of motivational content for the summit. One of the keynote speakers was Rudy Ruettiger! It was another great day connecting with successful people! In the evening, I got to share one of the highlights of my life with my husband, Tom! I am so honored and ecstatic to have attended the Golden Gala Awards and received a Quilly Award for becoming a best-selling author! A Quilly Award is crafted by the same artists who sculpt the Oscar- and the Emmy statuettes. I was also interviewed and photographed on the red carpet at this event. It was such an life-changing experience! 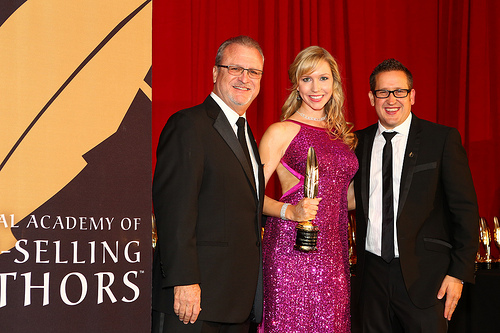 The venue was also amazing as the Hollywood Roosevelt Hotel hosted the first-ever Academy Awards ceremony! I feel so blessed and honored to have been given this experience. Day 41 complete. Receiving my Quilly Award was an experience of a lifetime!!! After the conclusion of the week’s events at the Hollywood Roosevelt Hotel, Tom and I got to walk along the Hollywood Stars of Fame after 1:30pm. Then we had the opportunity to go to Six Flags for a few hours of fun together. After that, we began our journey back to San Diego, stopping at a lovely Italian restaurant near downtown L.A. on the way. Day 42 complete. It was an amazingly incredible week that I’m so grateful to have had! I’m very pleased to share this successful experiment and experience. With the Event Preparation Experiment, I felt good and prepared for any type of event. It felt amazing to wear beautiful dresses while being photographed and interviewed on the red carpet along with receiving a Quilly Award. I enjoyed every moment of it! I would repeat this type of experiment for future events that I want to feel extra great at. Be sure to check out my original Event Preparation Experiment post for a list of all my posts! A Healthy England Trip and Book Launch! England to San Diego and Upcoming Event Excitement! It’s Empowering to Eat a Healthy Gluten-Free, Dairy-Free, Sugar-Free Diet! Wow amazing experience. Thanks for sharing the experience. It will definitely inspire many of us. Very nice article…I want to ask question same as hollywood will you publish article related to bollywood as well. Owsum blog thanks for making this admin . .